I’m taking a quick break from wrapping up work on CraftSanity Magazine Issue 8 and prepping for tomorrow night’s free craft event at Schuler Books to share a handmade story project I launched today in my newspaper column. I’m collecting handmade stories and started by sharing a story I wrote for Issue 4 of my magazine. 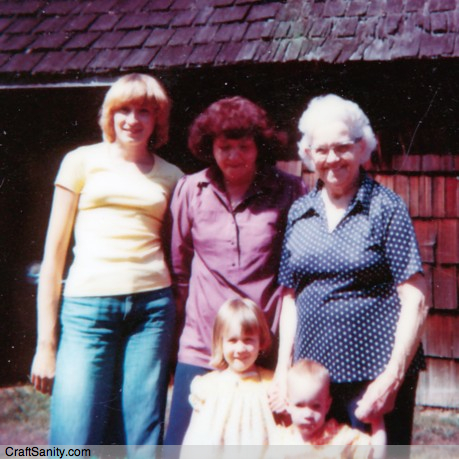 It’s about meeting my great grandmother for the first time in 1979 on her farm in Washington state. (That’s me, front and center, in the photo above holding great grandma’s hand. My little sister, Jacquie, is next to me and my mom and grandma are behind me to the left.) If you missed the story in today’s print edition of The Grand Rapids Press, please visit MLive.com to read the excerpt. 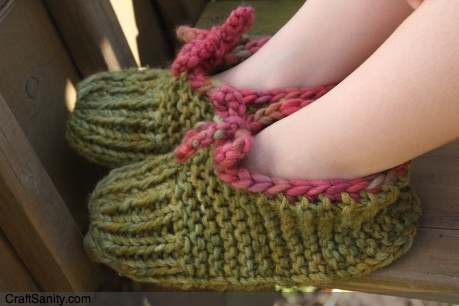 You can download the slipper pattern I wrote about here. Pattern information is on Ravelry, too. My column explains what I’m up to, so check it out for more info. In a nutshell, I’m essentially asking people to tell me the stories and traditions behind the patterns and projects they make. My plan is to interview and feature the people who send in the best projects and stories. Projects and stories can be emailed to me or sent via regular mail (I enjoy crafty correspondence!) to Jennifer Ackerman-Haywood, P.O. Box 888192, Grand Rapids, MI 49588. I’m going to get my work done while I wait to hear your stories. : ) Have a lovely day! certainly like your website however you need to take a look at the spelling on several of your posts. Many of them are rife with spelling problems and I find it very bothersome to tell the truth then again I will certainly come again again. Attractive element of content. I just stumbled upon your web site and in accession capital to say that I acquire actually enjoyed account your blog posts. Any way I will be subscribing to your augment or even I fulfillment you get admission to persistently rapidly. I simply had to thank you so much once again. I am not sure the things that I would have implemented without the actual opinions documented by you concerning this industry. Entirely was a real hard case in my view, however , taking note of a specialised style you treated the issue took me to cry over delight. Extremely grateful for the information and in addition pray you are aware of an amazing job you are doing educating the mediocre ones all through a site. I know that you’ve never encountered any of us.